Fireworks #56 is packed with quality this issue. 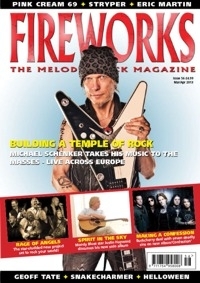 96 glossy pages span all corners of the rock globe - whether it's a chat to German guitar maestro Michael Schenker about his live album and DVD, or a look at the new solo album from English Moody Blues legend Justin Hayward. American rockers Buckcherry tell us all about their new album 'Confessions' while we investigate the star studded new release Rage Of Angels, which boasts the talents of Danny Vaughn, Tommy Denander, Robert Hart and many others. On the subject of collective talents, we have Snakecharmer featuring ex-Whitesnake men Neil Murray and Micky Moody. The German side of things is solidified with interviews with Pink Cream 69 and power metal pioneers Helloween - not to mention a revealing three page interview with controversial German born ex-Queensrÿche vocalist Geoff Tate. Finland's Von Hertzen Brothers give their thoughts about their new album, while Japan's very own Loudness are back with a bang. Denmark is covered thanks to the veteran Pretty Maids gracing our pages again, Poland's Riverside impress us with their record 'Shrine Of New Generation Slaves' and we also talk to two of Brazil's emerging stars, Vandroya and Pastore. We even have Heaven covered by talking to Christian rockers Stryper! Eric Martin, Dan Reed and John Corabi are just some of the other stars we have features on in our mind blowing selection of 32 interviews. The issue is rounded out with over a hundred new albums reviewed, as well as live gigs, reissues and all the other stuff you know and love us for. If you want more than that for the price, you're just being plain greedy!